Sunday afternoon. Spring has finally arrived. Swaths of browned grass emerging from beneath the snow on the margins of the lawn. Still significant piles of snow in other places, but the process has started. Solitary bicyclists riding up and down Center Road. Soon, they will gather into packs and spill over into the roadway, asserting their right to the same road as the cars. On this twisty, hilly state highway, not always a sensible choice, particularly when there are ample shoulders to accommodate bicyclists even two abreast. Carol sleeping, classical music from WSHU in my ear buds. The arrival of the sun and warming temperatures suggest an upswing after the very long winter. Along with the seasonal shift, there is a tenuous reason, shadowed by a great deal of uncertainty, that our lives might improve. Kyle H amilton, the new physical therapist, messaged me a week or so ago with pictures of a tilt wheelchair. In truth, I did not know what it was until I asked him. I could see that it was a wheelchair, but there wasn’t enough detail beyond that. I appreciate both the fact and its expression in that hoary phrase. But what, I asked, is its relevance to my situation? It will be a boon to Carol, he declares, get her out of the bed, reduce the threat of pressure sores from lying on her back, enable me to wheel her about the house, even take her to the outside. All, well and good, I respond, but do you really think we will be able to get her into it, or to use your jargon, enable transfer? Having worked with her a couple of times, and after extensive conversations with me, he believes this improvement might be in reach. He came to this conclusion not only from his own observation, but also by factoring in my insistent emphasis on Carol’s paralyzing fear of falling. If we can tamp down that fear, he thinks, she might regain the confidence to first sit up, then stand up, and if she does those things, she can then be helped out of the bed to a standing position and then to sit in the chair. He provided what seems to my lay person’s mind a very logical analysis. Having learned from me that Carol long ago was agoraphobic, and that only by an exercise of her formidable will did she overcome that fear sufficient to enable us to fly, he concluded that her dementia had robbed her of her executive cognitive functions, so that the fear, which he describes as primitive, reemerged with nothing to counteract it now. Therefore, if we can diminish that fear there is reasonable chance, as years ago she was able to work through it and get on a plane, that perhaps now she can reach the more modest goal of getting out of bed and into this marvelous chair. I take due note of all the qualifiers. But certainly, worth a try. What we need is something to tamp down the fear. His answer is buspirone, an anxiety reducing medicine that he says he has had good success using with other patients. He provided video evidence showing an elderly man pushing backwards as he is encouraged to stand. Just as Carol now does. But later, standing, and even walking. The result of a regimen of buspirone. Carol is now on it. He noticed her being more cooperative during his last session as he worked her with stretching exercises. I have noticed a troublesome increase in drowsiness and some loss of appetite. I am told that these conditions might well be the body adjusting to the new medicine. It is very hard to isolate causes, to divide those resulting from the meds, and those the product of the disease itself. The situation will have to be, and will be, monitored. I know, too well, how extraordinary it would be to achieve this reversal. I did ask Kyle for the width of the chair so I could see if it would, in fact, fit through the doorways in this old farmhouse. Fragile hope is growing along with the warming sun. As if in counterpoint, from outside comes the roar of motorcycles, indifferent to all those still inside. Tuesday night after an ordinary day of my shopping while the aide gave Carol a full bed bath. I continue to monitor Carol’s drowsiness and diminished appetite, trying to determine how much of these two conditions result from the progression of the disease on the one hand, and her body’s getting used to the new med on the other. Today, she ate a full breakfast, but the aide said she was not interested in lunch. She was sleeping when I came home, but when she got up expressed interest in supper and finished off the frozen lasagna I always serve her on shopping days. I don’t cook on shopping days. Yesterday, Kyle started his visit by measuring doorways to confirm what I had already told him in response to his concern, namely that the tilt wheelchair he wants me to buy will pass through these openings. 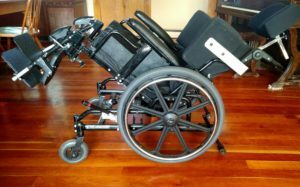 He worked very hard to take a step toward providing a solid reason for obtaining this wheelchair. He assures me that the price is a bargain, that years ago when his family got such a device for his quadriplegic father, it cost, literally, thousands more. We agree that although the price is a steal, the main question is whether it will be of use to Carol. Kyle was reasonably sure when he first proposed my getting it. After today’s session, he was more convinced, as was I. Because with great skill, determination, and patience, he got Carol to sit up on the side of the bed, and then bodily lifted her into our travel chair. She was not at all happy being made to sit up and resisted strongly his first several attempts. He persisted, offering self-effacing chatter, attempting to bribe her with offers of money if she would co-operate, and finally succeeded to obtain sufficient cooperation from her to get her into the travel chair where she sat, more or less comfortably for perhaps ten minutes. Then she then did what she has always done when in that chair, and that is to slouch and start to slide off. With my help, we righted her once, but when after a few minutes she started again to slide, we decided enough had been accomplished for one day, and Kyle hoisted her back onto the bed, where after a few moments she appeared to be again comfortable. Lying flat on her back. Still, progress had been made, sufficient to feed a small stirring of hope in tune, for the moment, with the promise of spring settling in outside our door where I see the daffodils, free of their snow blanket, raise their heads to the sun. Wednesday night. Carol and dog sleeping. I am starting this writing session a little earlier than usual because I am tired. It’s been an eventful day. Or more precisely, it was a very quiet day until Kyle arrived at about six o’clock. As he did last time, Kyle chatted, joked, and prodded Carol into some very positive results. He managed to have her sit up on the side of the bed two or three time. She offered strong resistance the first time, but after he let her rest for a while, the next times went more smoothly. She sat quietly with him at her side. He worked the bed’s controls so that both the head and the foot of the bed rose forming a kind of valley where she sat with cushions placed behind her to support her back, and her feet over the side and reaching the floor. All of this took some time, and I didn’t think he was going to attempt much more. He wheeled the transport chair over next to the bed. He sat in it and pulled the seat belt around himself, trying to guess at a setting that would fit Carol. Then, having asked me to stand behind the chair to steady it, he placed one arm under Carol’s legs at the back of her knees, and the other around her upper back and lifted her into the chair. He secured her with the belt. I remained behind the chair, stroking her cheek, assuring her she was quite ok. He wheeled her over to the dining room table where I removed a chair from the head of the table to make space for the transport chair. For reasons we have not yet determined, she always looks either straight ahead or to the left. Kyle had me sit where I would be in her line of vision on the left, and took the chair on the other side. There were three fortune cookies on the table from Monday night’s Chinese take-out. I offered Carol one, read her fortune, which had something to say about behind every able man was another able man, and I played with the gender designation a bit. Carol happily ate the cookie. I was quite pleased that she did because her appetite has diminished on buspirone, and keppra which she takes to prevent another seizure. Then Kyle wheeled her back to the bed and lifted her into it. Carol did not always accept these transfers without expressing her unhappiness in a voice that hit some loud, high notes. Other times, she was quiet and accepting. All in all, quite a productive hour. I believe Kyle pushed faster than I thought he would, although remaining careful not to stress Carol, because he plans to close the deal on the tilt wheelchair. Convinced now that it will work for Carol, he will pick it up from Cadillac on Sunday, and bring it here. He will need to customize it to conform to the dimensions of Carol’s frame. I did not know that was involved, but he says it is and he has done it before, just a little deconstruction and reconstruction. He remains confident that, given the progress he has made, we will reach a point where I alone can get Carol into and out of the chair. She will spend her days in it instead of the bed. She will eat at the table, and perhaps even, with the help of some ramps, be wheeled outside. Where she can see the daffodils closeup. And perhaps with some kind of implement do a little gardening. But why not aim high and see how close we can get? Sounds exciting. Hope she can make it outside to see the flowers. Marvelous. Goddess bless you, Carolyn, Kyle and the perky daffodils. Alzheimer’s offers little hope. Accept it however it comes. A little more freedom for Carol is a little more freedom for you. Congrats on some big steps thanks to Kyle’s help. Steve, this chair sounds like real improvement in quality of life. I’m so glad that can still happen. It’s beautiful when we find people that are gems, sensitive caring souls, like Kyle. This is wonderful news to hear about this amazing tilt- chair and Lowell and I are so glad to know that Carol is responding so well. It’s good to think that positive steps like the ones you describe can perhaps lead to even more positive steps for both Carol and you. It renews my spirit to know there are people like Kyle out there, a sensitive soul that can make such a difference.